Data for 2018 has now been added to the results day microsite we have produced with the support of the Nuffield Foundation – explore the data yourself. The last few years have seen a series of major changes to qualifications and secondary school accountability. Both have affected the number of 16-year-olds entering GCSEs in different subjects. In this blogpost, we look at the changing fortunes of different subjects. 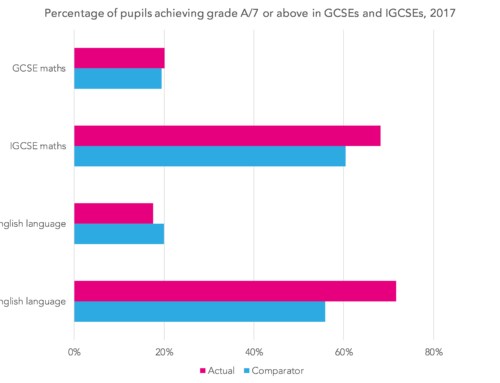 Generally, English Baccalaureate (EBacc) subjects have been the winners and other subjects the losers. But, as always, it’s more complicated than that. The EBacc was introduced as a performance measure by the Coalition government in January 2011 and calculated retrospectively on 2010 data. 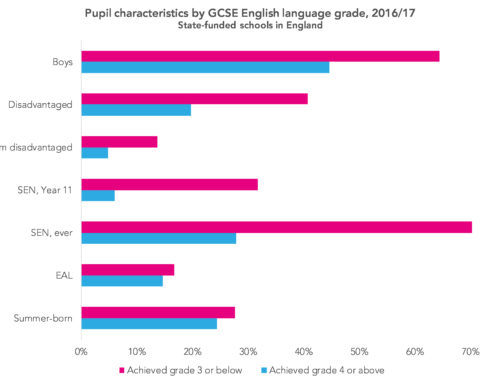 It summarised the percentage of pupils at a school entering and achieving grade C or above in English, maths, two science subjects, a humanity (history or geography) and a modern or classical foreign language. 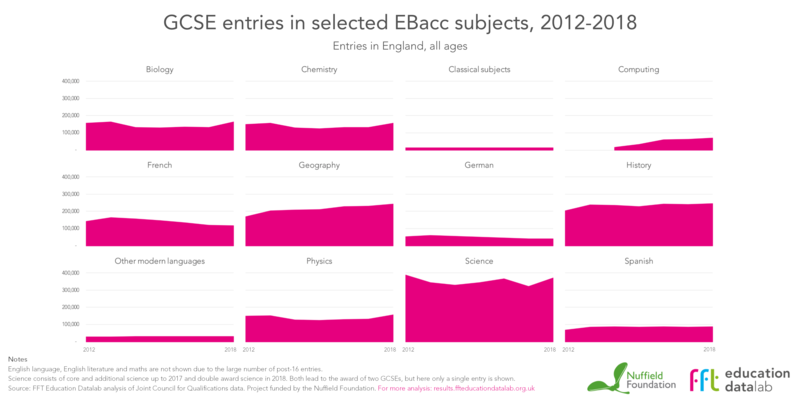 The graphic below shows how entries in those subjects have increased since 2012 – notable exceptions being French and German. These increases are noteworthy given that the population of 16-year-olds fell every year from 2013 to 2018. 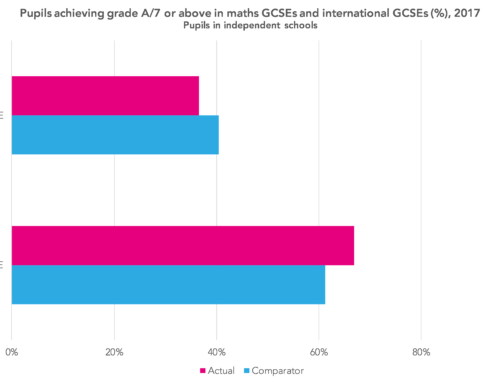 (We don’t show English and maths because entry numbers are heavily affected by post-16 resits). Some of this increase was due to students switching to GCSEs from non-GCSE alternatives, for instance switching from BTEC science to GCSE core and additional science. This was particularly the case in 2014, the first year of school performance tables (league tables) affected by the government implementing the recommendations of the Wolf review of vocational education. Secondly, entries in Level 1 and Level 2 certificates (IGCSEs) in biology, chemistry and physics no longer count in school performance tables, and this has contributed to some of the increase in entries in GCSEs in those subjects. There was a dip in science in 2017 due to schools not entering Year 10 students in core science a year early because, with the discontinuation of core and additional science, results would not be eligible for performance tables when students reached the end of Key Stage 4 in 2018. Other subjects have fared less well, as the graphic below shows. Design and technology has been in long-term decline ever since it stopped being a compulsory subject at Key Stage 4 at the start of the century. The fall in 2018 appears even more pronounced, but this is due to food technology being replaced by a new GCSE in food and nutrition, which is reported separately in GCSE results data. Other subjects appear to have initially increased in entries and then fallen away. Most of the increase between 2012 and 2015 is due to schools switching from qualifications that became ineligible for performance tables following the Wolf review. The classic example is religious studies, which we wrote about here. Initially we see an increase in students taking the full course GCSE, but this was entirely driven by switching from the hitherto popular short course. Since 2016, numbers have begun to fall. The same applies to most arts subjects (drama, music, performing and expressive arts). The increases between 2012 and 2015 are the result of schools switching back to GCSE from alternative qualifications, as we wrote here. Entries have fallen compared to 2015 even in art and design, in which entries increased between 2017 and 2018. 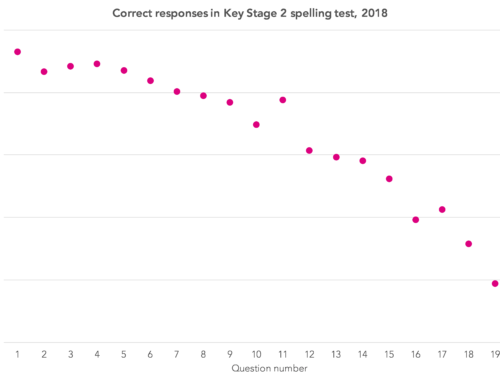 In percentage terms, the subjects which have seen the largest falls in entries since 2015 are statistics, in which reformed GCSEs will be awarded for the first time next year, and ICT, which is not being reformed. Entries have fallen by 73% and 57% respectively.